I LOVE the beach! Anything warm and tropical makes me happy! Including things that remind me of being at the beach...such as coconuts, pineapple, and pina coladas! My husband is the exact opposite! He hates the beach, hates pineapple, and really hates coconut! My cousin introduced me to this cake when I was really little and I haven't had it since! It has really been weighing on my mind for years, so I decided to recreate it my way....and MMMM! It was good! 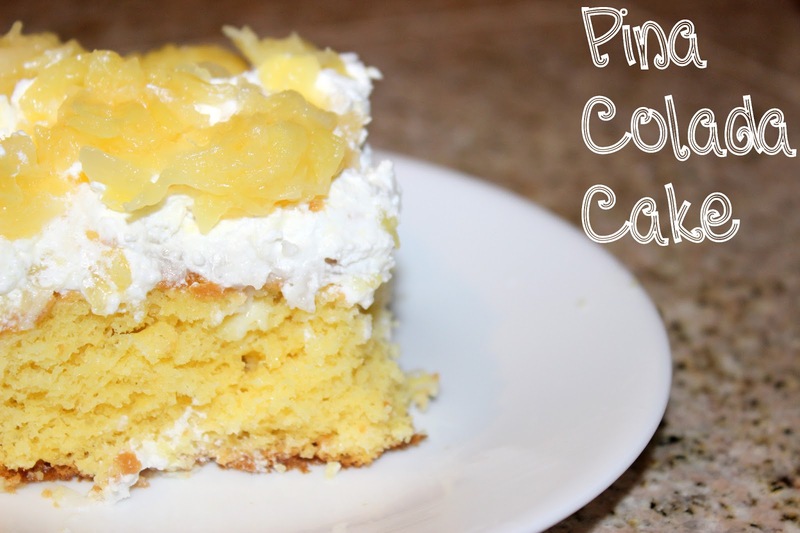 It's full of coconut flavor, pineapple, and cool whip. If your feeling frisky...you can even add in some coconut rum :-) I would have totally done that if I didn't have to share with my 1 year old! Make yellow cake mix according to box and bake in a 13 x 9 pan. When it is done, poke holes in cake and pour bottle of cream of coconut on top. If you are using rum, now would be when you would sprinkle a few tablespoons on top of the cake. When the cake is cooled spread coconut all over the top. I only used half a bag but you can use the entire thing if you like. Next, I spread cool whip on top of the coconut layer. Evenly distribute the crushed pineapple on top of the cool whip. Now sit back, eat your cake, and pretend you're in paradise!